In case you haven’t noticed, I love goals. I love everything about goals, in fact. Maybe it is the perfectionist in me, but I have managed to get a firm grip on all things goals over the years. If the thought of setting goals overwhelms you, take a step back and keep reading for a minute because I’m guessing if goals haven’t worked out all that well for you, you haven’t even taken the first step toward success. Not that you haven’t tried, of course, but because you haven’t started in the right place. Yep. I firmly believe that you need to start in the right place. Then, I think you need to take them from there and work through them from large chunks down into bite-sized pieces. It’s not enough to set some goals, you need to them make them happen by following a progression of steps that unfold in a logical and attainable way. Wondering what I mean? 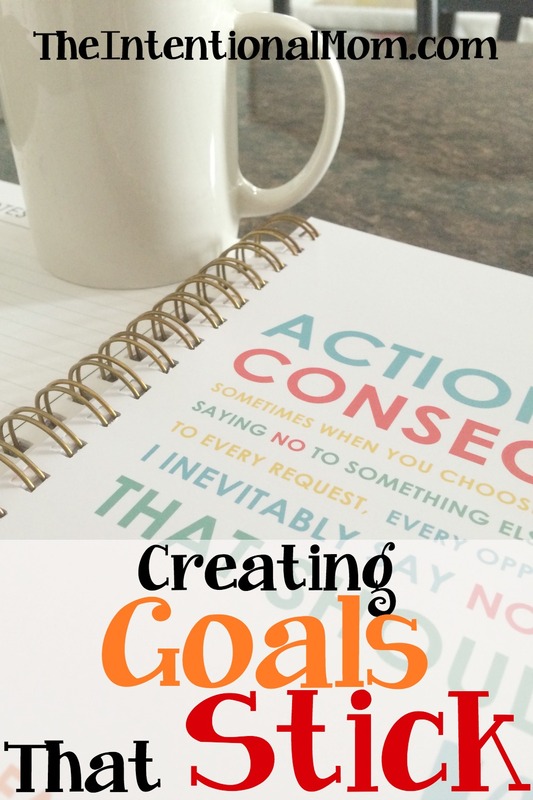 Here’s what you need to know about creating goals that stick. Start with a fresh slate. Clear your mind of anything about you and goals, clear your mind about someone else whose success you admire, clear your mind of a previous roadmap toward your goals. Start clean right now and then be ready to move forward. As I’ve written in 10 Reasons You Might Not Be Accomplishing Your Goals, you may have been grabbing someone else’s goals and taking them as your own. This just won’t work. Got a clean slate? Ok then, let’s keep moving. Where do you see yourself in two years, in five years, in ten years? Create your long term vision with where you want to be at these monumental landmarks, and then write this all down. You will be able to work with these further in the next step. Using your longterm vision from the previous step, create some goals in the specific areas that are involved in your overall vision. Be sure that your goals spell SUCCESS or they won’t be effective. And yes, write this down. If you haven’t written a mission statement, I walk you through the process in Creating a Personal Mission Statement. Not sure why you need one? I take care of that, too, in 10 Reasons You Want a Mission Statement. Take time now to write and then gather your mission statement before going further because from this point forward, everything you do will be matched up to your mission statement to be sure that your goals are not taking you away from your overall mission statement. This is another reason that people have a hard time reaching their goals. Take your specific goals from the previous step and transform them into an annual plan with your mission statement as the foundation. Which part of your goals can you reasonably accomplish this year? Don’t be too hard on yourself here, but don’t sell yourself short, either. Take your annual plan and break that down further into monthly plans. By now this process should be getting easier. I hope you are sensing the pattern of looking to the earlier step for reference in completing the step that is before you. I hope you also see the pattern of taking something that is big and breaking it down into manageable pieces. Again, be sure to create monthly plans that are challenging, yet attainable. Everyone really does work better with an incentive. We all like to be rewarded for hard work, don’t we? Now that you have your monthly plans, you will work so much harder to accomplish them if you’ve got an incentive of some kind. Nothing big or extravagant is needed, just an incentive that is something you find rewarding. In working with people in a one on one basis through personal coaching, I find so often that this is what is holding them back more than anything else. So often you can have a game plan before you and just be afraid, hesitant, unsure, or just too weary to take the first step. I cannot tell you the numbers of times that I have heard from someone who has heard me say this that they took the first step because they heard my words telling them to do so. So, hear me say, take the first step. That’s really all you need to do. Don’t worry about the rest. No matter what your previous experience is with goals, these are the key steps in creating goals that stick. Now, get out there and turn that dream into a reality! « Crazy 8 – Super Cheap Deals – $9.99 Jeans, $6.39 Swim, 70% Off + More!